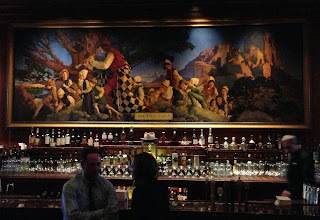 The Pied Piper was established in 1909 in the reconstructed Palace Hotel (after the great quake). The original Palace Hotel, built in 1875, hosted presidents Grant, Harrison, McKinley, and Teddy Roosevelt. The new hotel has hosted presidents Taft, Harding, FDR, and Clinton -- with Warren Harding passing away there. It's also hosted Oscar Wilde and Sarah Bernhardt, who arrived with her pet baby tiger. 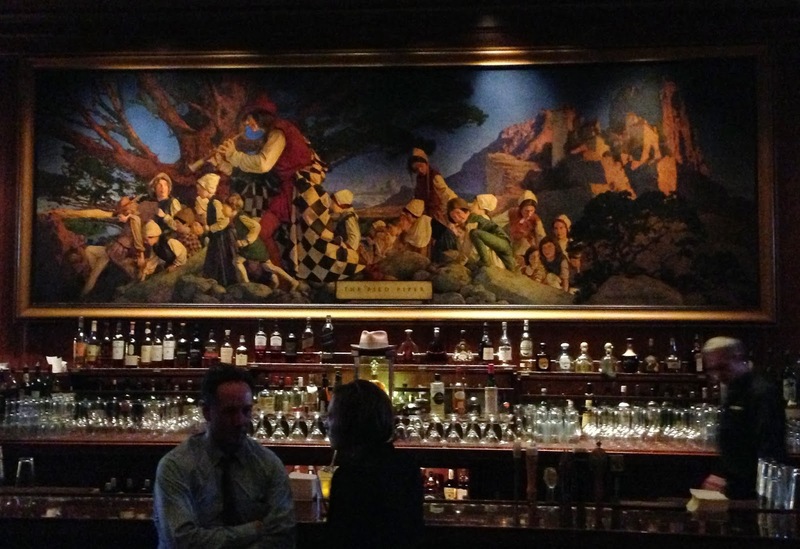 For the opening of the Pied Piper Bar in the newly constructed Palace, Maxfield Parrish was commissioned to create a 16 foot long by 6 foot tall painting, which has resided behind the bar with limited interruptions every since. One of those interruptions came shortly after my visit, as the hotel concluded that it did not make sense to keep an artwork worth millions of dollars sitting behind a bar. But a public outcry ensued, thousands of signatures were gathered protesting the move, and the owners subsequently changed their minds and returned the painting after some restoration work. A bar tender in the old version of the hotel wrote one of the definitive books on cocktails in 1891, William T. Boothby's "Cocktail Boothby's American Bartender: The Only Practical Treatise on the Art of Mixology Published." (Yes, the term "mixology" dates back to the 19th century.) The current bar maintains a focus on the classics, and provides one of the more elegant settings in the city to sip a drink.